Rich woods, beautiful floors and easy access to the living area make this kitchen a perfect place for entertaining large or small groups. 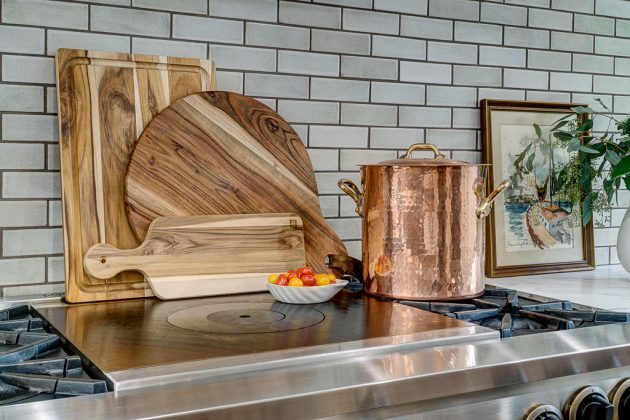 It’s no surprise that kitchens are truly the heart of any home. It’s where we start and end our days with breakfast and midnight snacks. What is a surprise? The way architects and interior designers embrace the latest trends to make the kitchen the perfect gathering place for friends and family. The center island has replaced the living room coffee table. 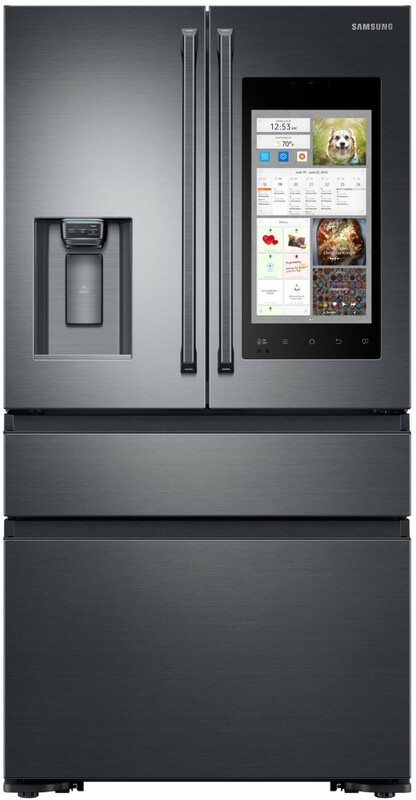 It has assumed a more vital role than ever before, turning the kitchen into the family entertainment center. Kitchens are light-filled, ever so open, sleek and sophisticated. Appliances are high-tech with helpful robotic personalities. The color palette is hushed – crisp whites, soft creams, blues and grays, as gleaming as finely polished silver. 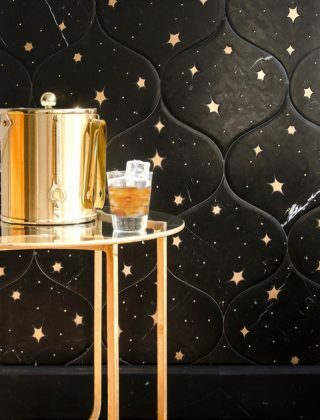 impressive accessories in these bathrooms show our readers how to create a perfect setting for ultimate relaxation. 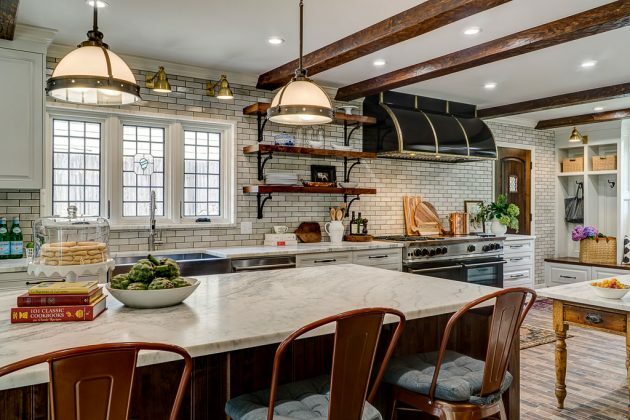 A new home near Philbrook Museum in midtown Tulsa gave interior designer Carolyn Fielder Nierenberg the opportunity to create luxurious bathrooms and a stunning kitchen, all designed with special amenities. 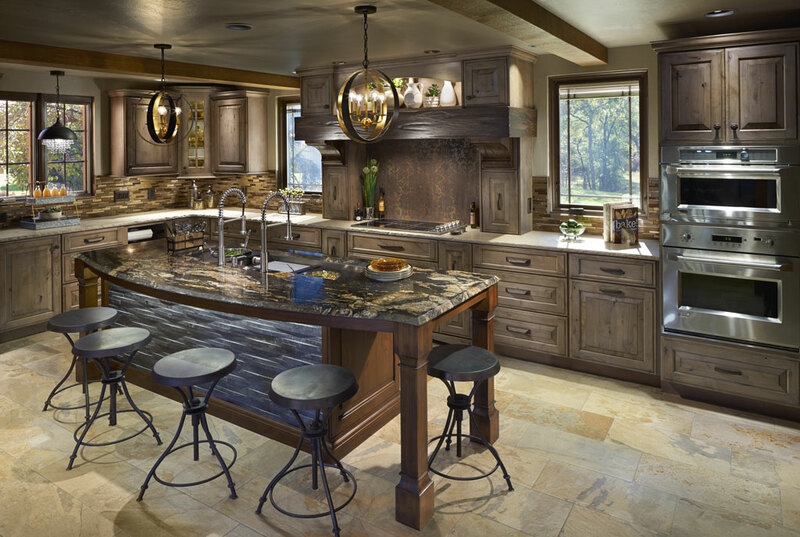 A large center island with a textured granite top dominates the kitchen. Caesar stone cabinets and a wood floor are other features. The large brushed nickel light fixtures complement the high ceilings. Since the family has two young children, the spacious kitchen needed to be user-friendly. The center island was designed as a perfect place for their early morning breakfasts and after-school snacks with friends. 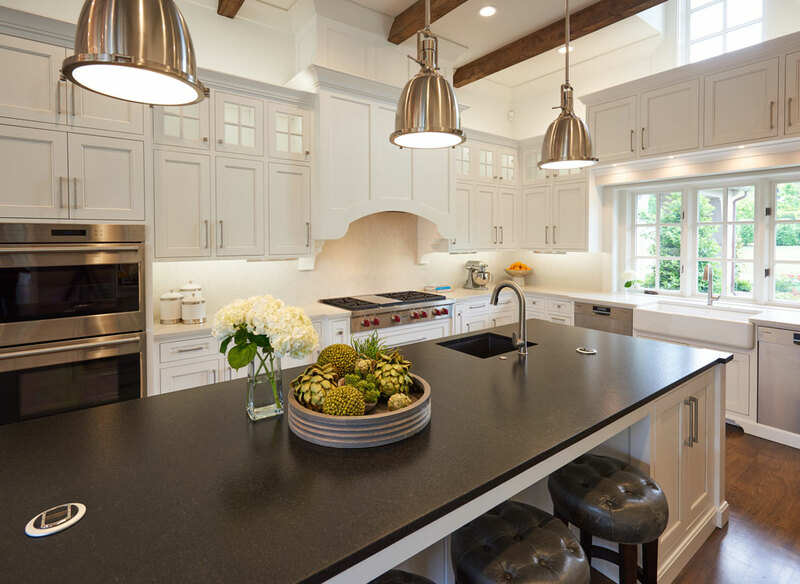 The island is fashioned of leathered black granite that shows no wear or child-size fingerprints. 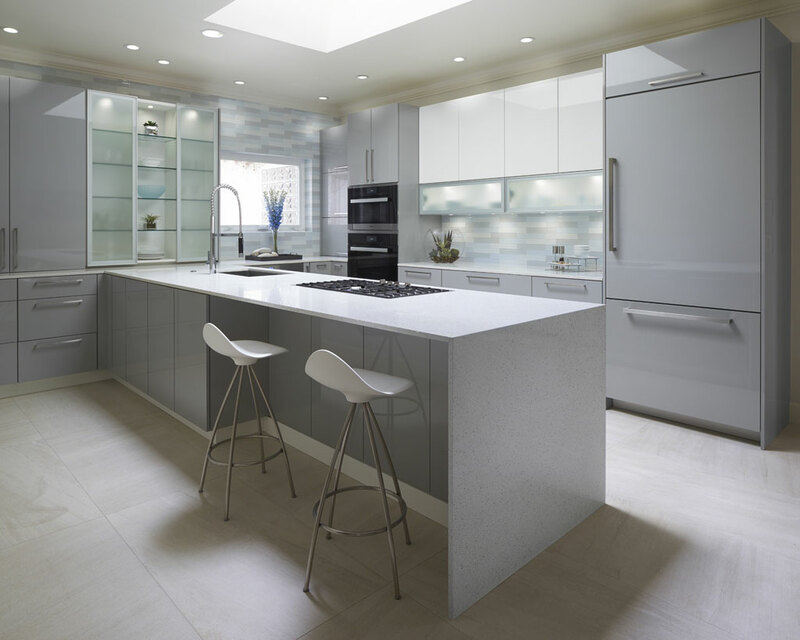 Stainless steel pendant lights feature frosted glass to limit glare over the island. 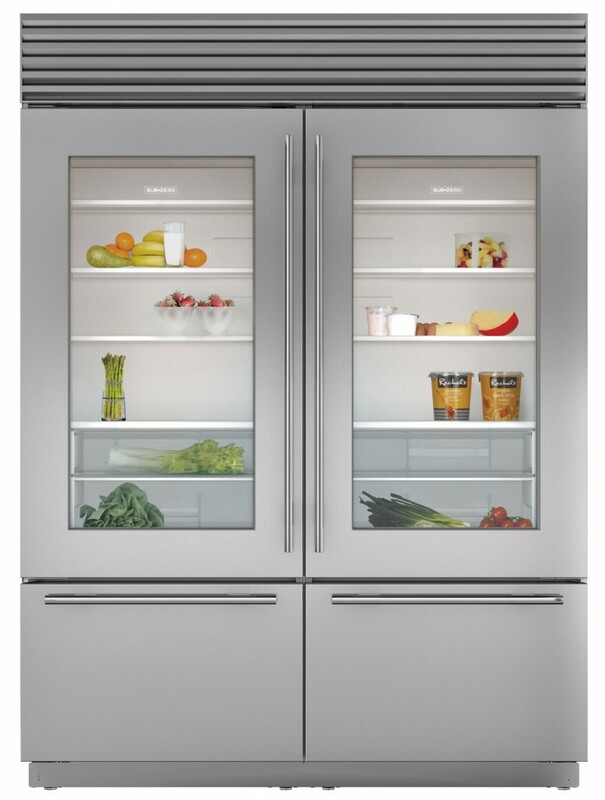 The brushed stainless steel is mirrored in the kitchen appliances. The cabinets, provided by Kitchen Concepts, were factory finished for durability. The island is surrounded with a light gray Caesar stone, complementing the gray and white color scheme. 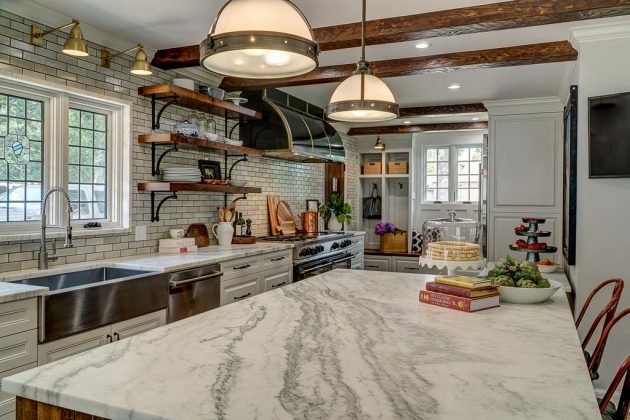 Spanish white 3-by-6-inch beveled subway tile comprises the back splash. Gray-stained rift sawn white oak floors anchor the kitchen. The small yet elegant powder room utilizes darker color schemes for variation. In this kitchen, filled with low maintenance appliances, paned windows are a special feature. They reach to the 15-foot ceilings to create a sunny, light-drenched environment for cooking and casual entertaining. 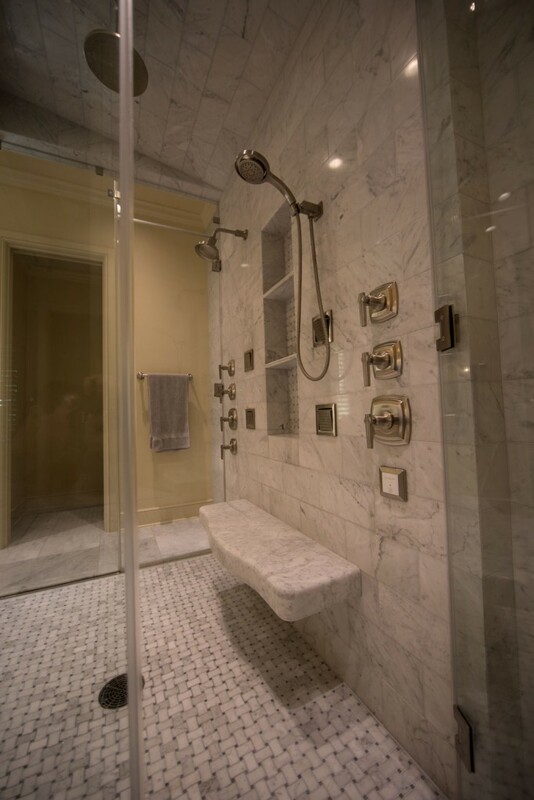 Personal amenities abound in the master bath. A shower with “his and her” doors divides the wife’s bathroom from her husband’s bath. The shower has solid sheets of tile as walls. The flooring is designed of 2-inch hex Turkish white polished marble with a light gray grout. The brick walls are fashioned of the same product with light gray veining. The large vanity includes two separate areas for a sink and a makeup area. The Kitchen Concept cabinets allow a custom design for the placement of the knee space. Hexagon-shaped marble anchors the bathroom floor. The same soft color scheme of the kitchen is repeated in the master suite. Stained white Turkish tile was placed behind the vanities. The large windows overlook the expansive back lawn and feature motorized shades for privacy. A small, elegant powder room is set by the entry to the master bathrooms. The kitchen and baths both reflect the family’s love for living in a home that has all the modern amenities for luxurious living. Jeff Johnson’s parents had no idea when they established TileStone Distributors in the 1970s that the Tulsa company would become a niche market for luxurious tile and stone accents in kitchens and bathrooms. 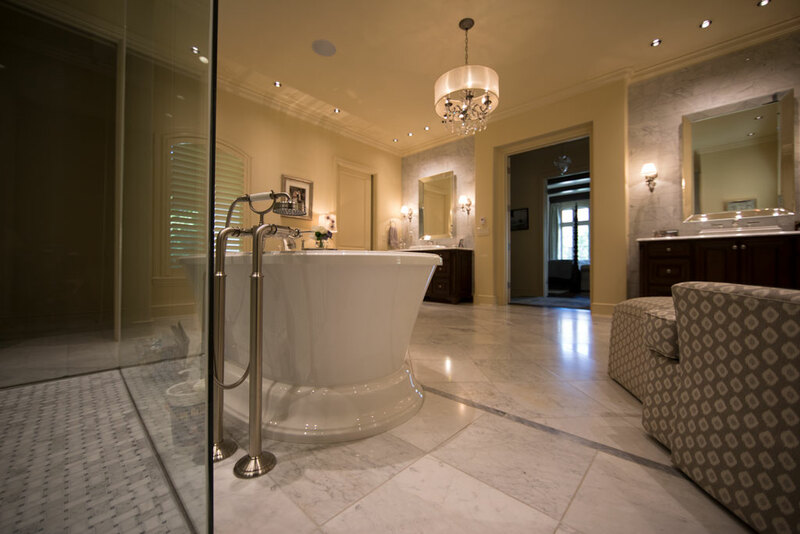 A recent bathroom project in an upscale midtown Tulsa home represents the best of this firm’s talents. 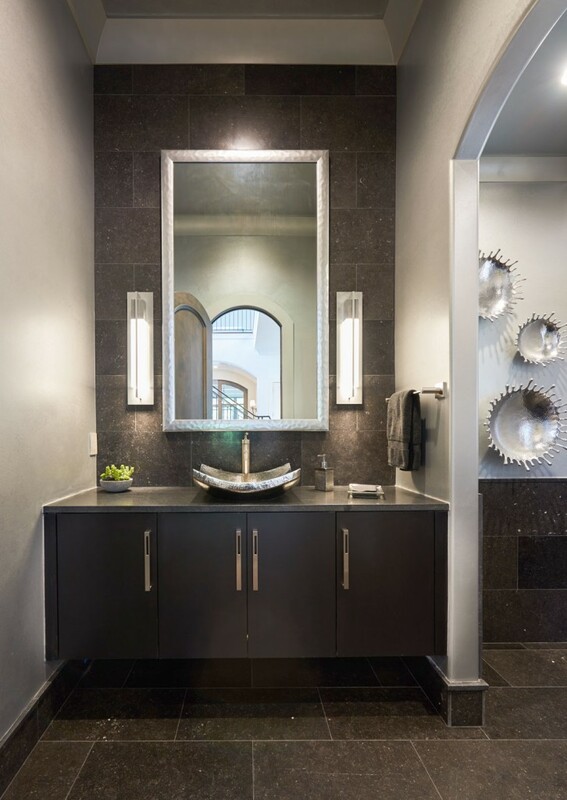 Jeff chose a light and dark gray color palette to complement the marble and glass used in the master bathroom. The spacious bathroom exudes elegance with its size, a grand chandelier and a color scheme reflecting the design world’s love for shades of gray – the new neutral. The materials provide a new vocabulary for bathrooms with many European tiles, marbles and porcelains that are brushed, honed and polished. 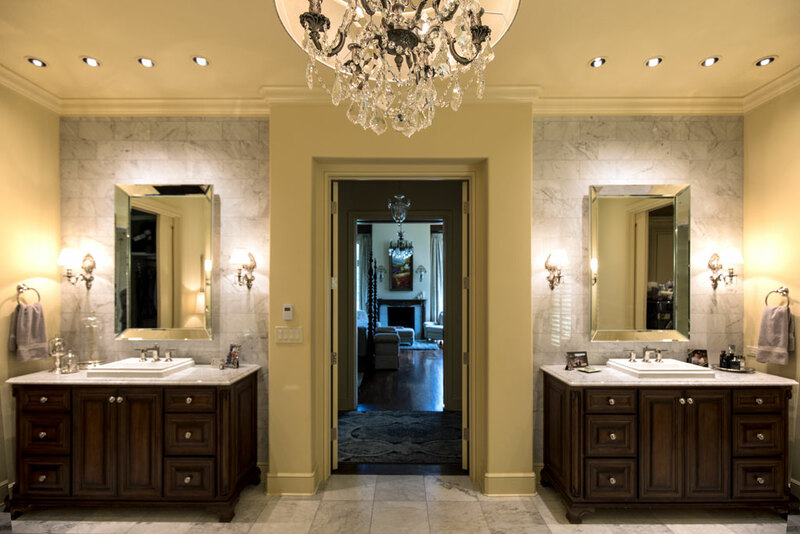 Twin vanities, oversized mirrors and soft lighting create a romantic aura in this bathroom, which reflects all the hallmarks of a beautiful lifestyle. Johnson and his son, Kramer, were drawn into the project when builders Jack Arnold and Tony Jordan asked them to implement several design details. The polished marble mosaic for the floor also was used on the back of the recessed oversize niche in the shower. Architect John Duvall has the expertise to show that a 1928 kitchen can be transformed to function in the 21st century. 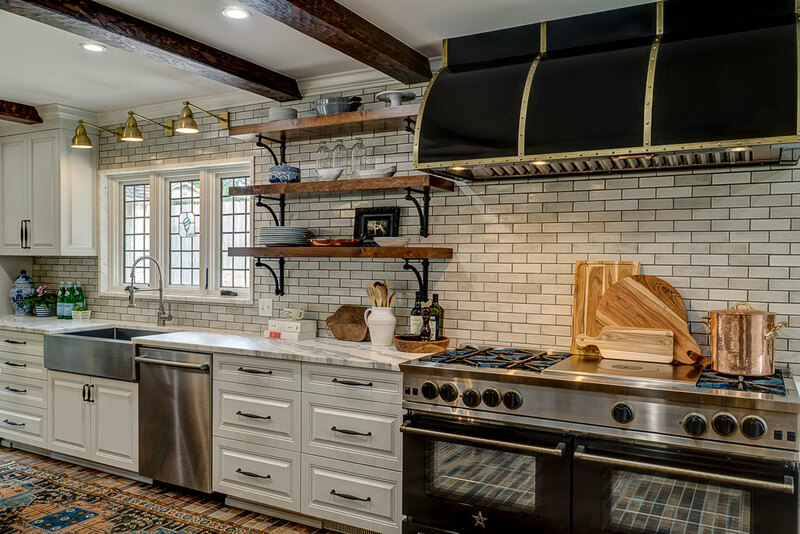 “The kitchen in this Forest Hills home in midtown Tulsa was designed by the late Charles Dilbeck,” Duvall says. “It is one of the grander renditions of the French country style that was typical of Dilbeck’s work in the 1920s and 1930s. 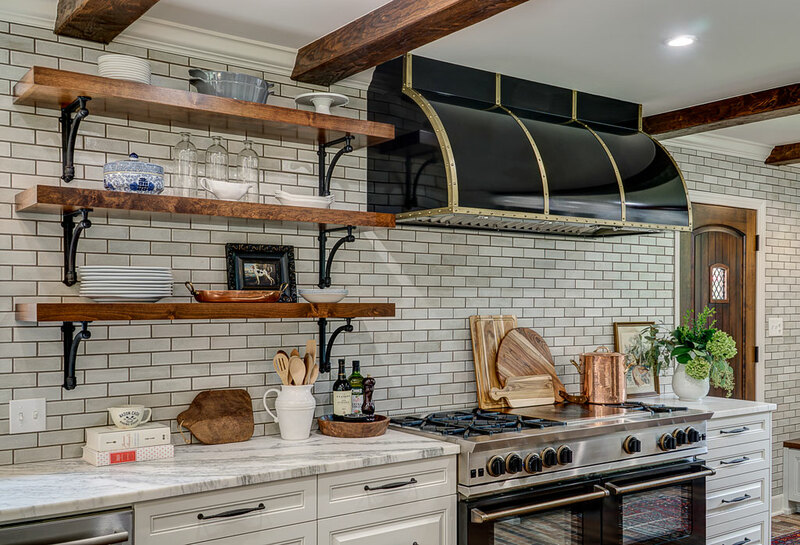 The main focus of the kitchen is a 60" professional range and custom hood with a black enamel finish and brass accents. The range features a traditional "French-top" cast iron cooking surface in addition to traditional gas burners. The kitchen blends seamlessly with a seating area, perfect for relaxing before and after meals. 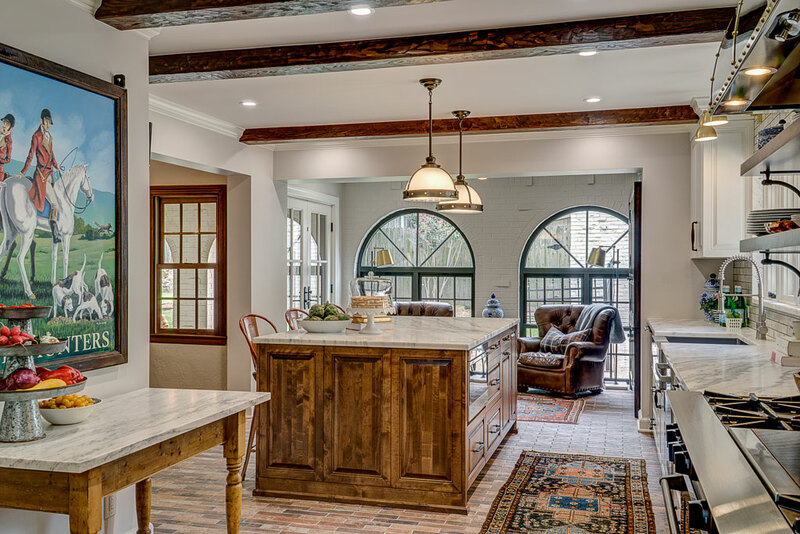 Fir wood beams and recessed ceiling lighting add to the warmth of the kitchen from the pendant lighting over the ample center island ~ the family's favorite place to gather. 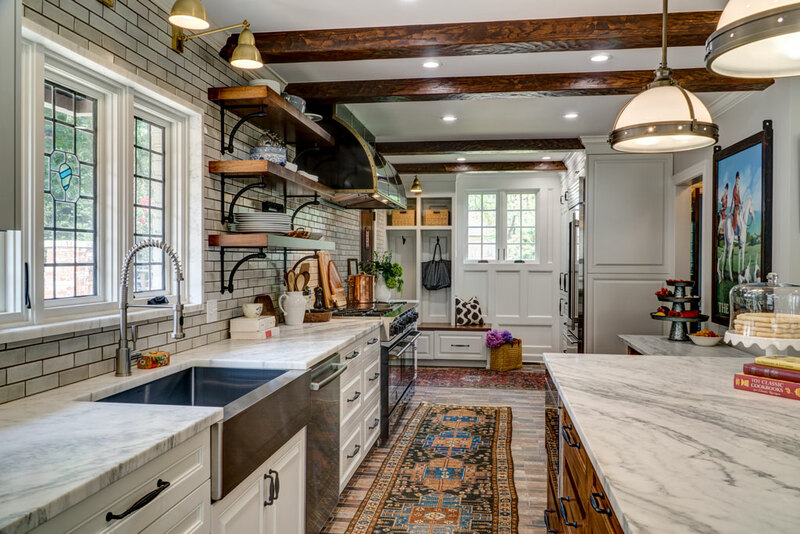 The use of off-white for cabinets and other areas brightens this kitchen, which includes an antique brick tile floor, softened with an area rug. The door at the rear left is the family's main functional entrance near the motor court at the side of the home. The airy kitchen is dominated by a large center island of alder wood. The functional room includes arched windows, and pendant and recessed lighting to create a light-filled space, perfect for cooking and entertaining. Fir wood beams and recessed ceiling lighting add to the warmth of the kitchen from the pendant lighting over the ample center island – the family’s favorite place to gather. The homeowner, an avid cook, wanted a more functional kitchen design that would open to the adjacent dining room and include a comfortable sitting area. Duvall’s challenge was to integrate modern appliances and conveniences while using design details respectful of Dilbeck’s original design. “The goal of the design was to create a light, open feeling, while maintaining some of the richness and detail of the original home,” Duvall says. He accomplished the goal with a series of major face-lifts. First, he blended light cabinets with an off-white, glazed, handmade tile on the kitchen’s focal wall. Next, he created a stained alder wood island and stained alder wood open shelving. 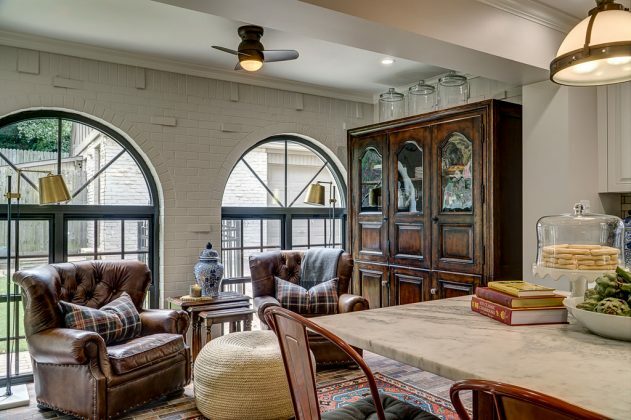 Along with adding stained fir beams to match existing beams in the dining room, Duvall also introduced an antiqued brick tile floor extending from the side entry door to the door leading to the back porch. Sleek, seamless and shiny as polished silver. That was the desire of a Norman homeowner who asked Brenda Helms to remodel her early 1990s traditional Dallas-style kitchen. The designer replaced dated red walls and minimized decorative ornamentation by using the light blue-gray and white color theme. The homeowner’s desire was to have a modern kitchen where she and her husband could cook and enjoy entertaining guests. She also wanted a well-organized space with a place for everything. 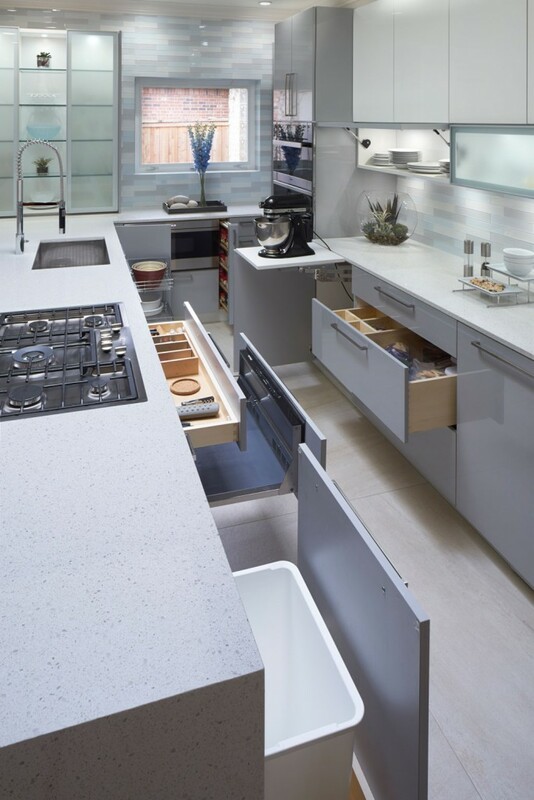 Banking on the current on-trend color theme – light blue-gray, white and silver – Helms used a mix of white, high-gloss acrylic for the cabinets. 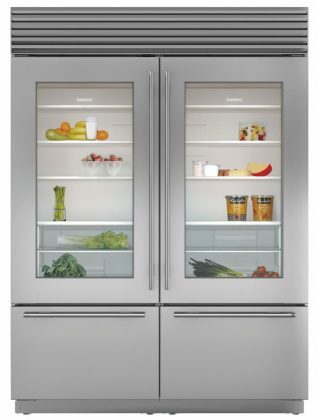 A silvery, light blue-gray high-gloss acrylic, with a dash of brushed aluminum, was chosen for the frosted glass doors. 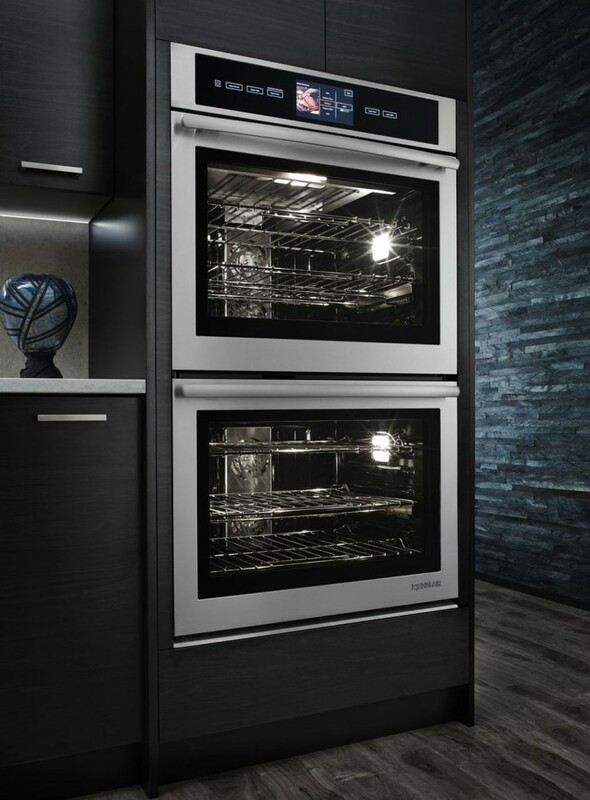 A bevy of Miele kitchen appliances and storage units makes cooking and entertaining a breeze. To make the kitchen highly functional, Helms selected Miele brand appliances from Germany. As Helms completed the renovation, she hoped guests would feel “refreshed” when they saw the kitchen’s modern transformation. She wasn’t disappointed. Neither were the homeowners. “Guests have commented [that] they just want to linger there for a while,” Helms says with a smile. When Brenda Helms stepped inside an old-fashioned, two-story home in south Stillwater, she knew it needed a major renovation. She still remembers that encounter vividly. 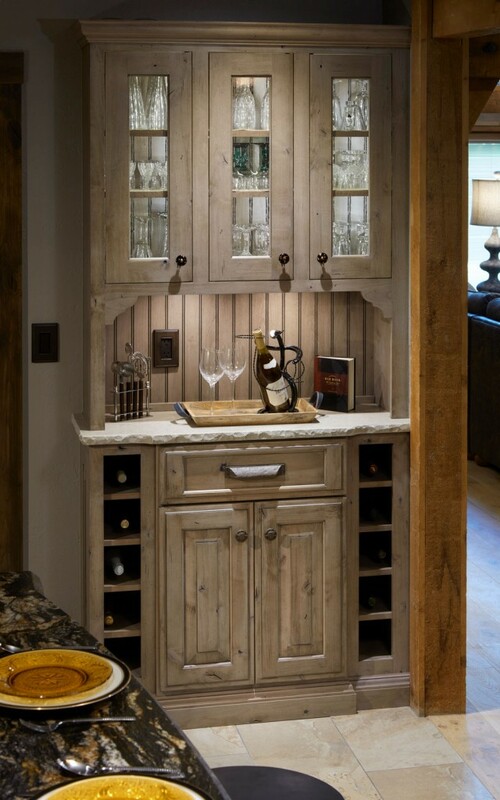 An artful wine storage area adds another layer to the warm kitchen. The redesign was not just a casual kitchen makeover, but an overhaul that engaged almost every part of the home. “After rebuilding the floor, raising a wall that had sunk through the years, dealing with cracks in the foundation, leveling floors and relocating three walls, we then proceeded to add new rear windows that overlook the beautiful creek and wildlife that frequent this country setting,” Helms says. 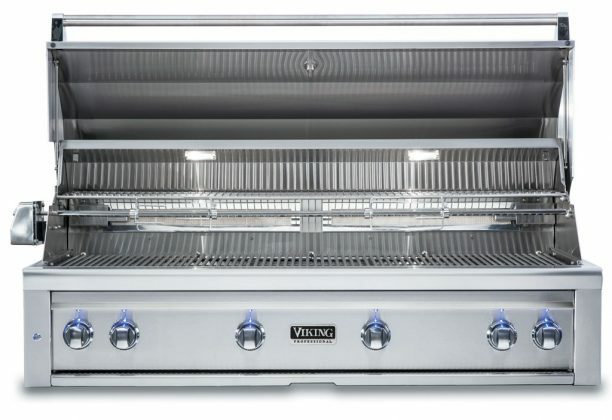 When it came to taking an ugly duckling kitchen into the 21st century, Helms was well equipped for this daunting task. 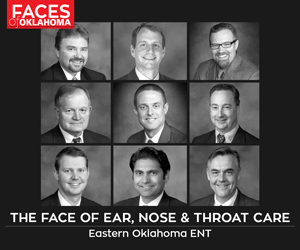 She and her husband, Robert, have owned Edmond Kitchen and Bath for 16 years. The large island was designed for versatility and entertaining guests. With a salad and soup well, a plentiful buffet serving area, guests have a choice of entrees. Helms chose a color scheme of natural browns, grays and creams, peppered with dashes of black and rust. “The biggest challenge in the kitchen involved careful space planning and tying the kitchen and living area together to create a more open feeling in the home,” she says. “Low maintenance was also a goal. The couple have two dogs, so we used a light slate-colored porcelain tile in these areas. Helms says the home is a great example of rustic farmhouse elegance and how a forlorn kitchen and living area now express a modern, functioning lifestyle. 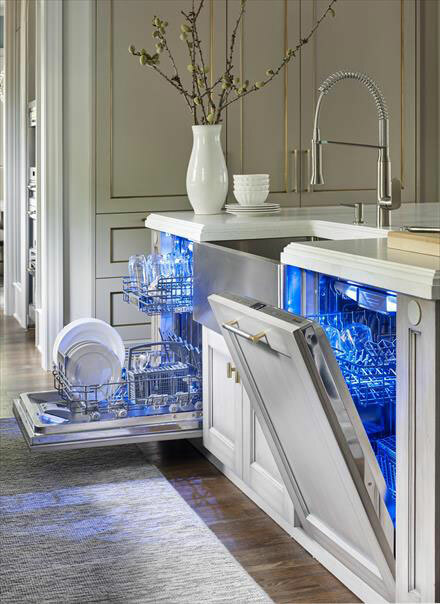 In the dynamic realm of interior design, technology and style meld together in the creation of exciting appliances. These kitchen wonders provide the consumer with cutting edge technology and efficiency partnered with the sleekest looks that mirror popular design trends of the time. Style and efficiency combine for a magical – and trendy – result. 01 Private cooking at a professional level. 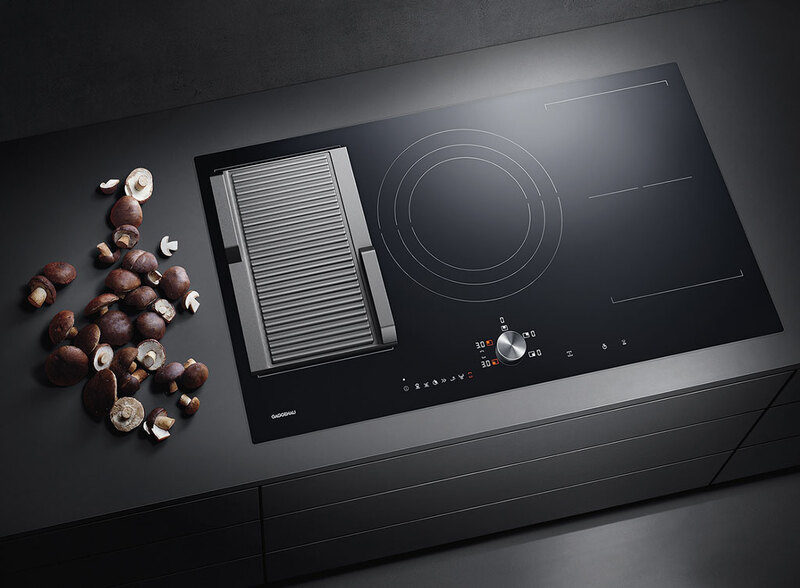 The new Gaggenau flex induction cooktops offer more convenience and even more flexibility. 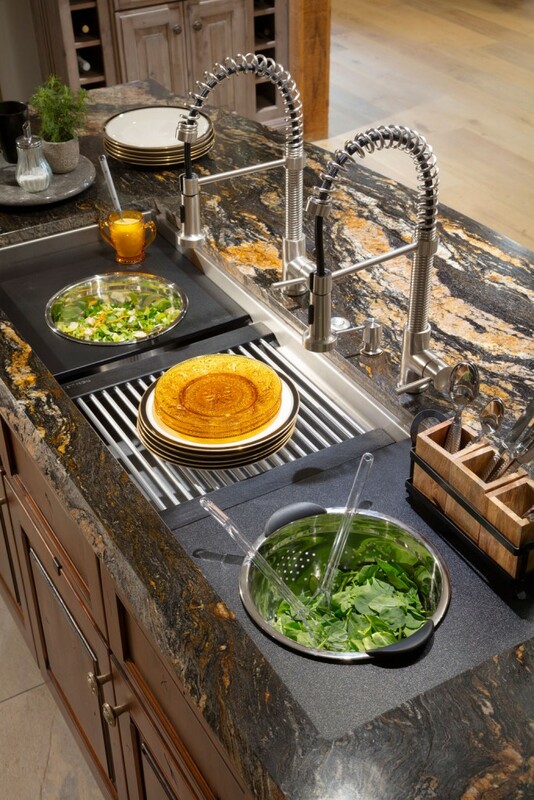 Their functions allow the positioning of cookware in different shapes and sizes.